When Constance Georgine Markievicz became the first woman elected to the British parliament in December 1918, she was far from the Dublin St. Patrick’s constituency she won with two thirds of the vote. The republican leader known as Countess Markievicz was held at Holloway Prison, in England, for her role in anti-conscription protests earlier in the year, before the Great War ended in November. A demonstration of welcome had been organized at Liberty Hall for Madame Markievicz, and at 6 p.m. a large crowd assembled at Beresford place, where a procession was formed by the Citizen Army, headed by the St. James band, and including such bodies as the Cuman na mBan, Fianna, Irish Women’s Franchise League, Sinn Fein bodies, Irish Volunteers, and trades organizations. … She entered Liberty Hall amidst loud cheers and the waving of Sinn Fein flags from the windows. Addressing the crowd from one of the windows as “Fellow Rebels” … she said that it was worthwhile going to prison to find such a reception awaiting her … and advised them to work for an Irish republic. The Irish Press, Philadelphia, which had direct ties to the two-month-old Dáil Éireann, suggested that “it seemed as though everyone in the Irish metropolis had turned out to do honor to this notable Irish woman patriot.” The story disputed wire service reports that Markievicz would take her seat in the British House of Commons. This entry was posted in History, Irish War of Independence, Journalism, Politics and tagged Chicago Daily News, Countess Markievicz, Ruth Russell, The Irish Independent, The Irish Times on March 19, 2019 by admin. The centenary of the first Dáil Éireann and preceding December 1918 election that swept Sinn Féin to power were marked at the Embassy of Ireland, USA. Irish Ambassador Dan Mulhall said the two events are often “overshadowed” by the 1916 Easter Rising and Irish War of Independence. Sinn Féin‘s use of the phrase Declaration of Independence “was not by accident,” Mulhall said, but deliberately meant to evoke the American political statement of July 4, 1776. The Irish declaration, however, was very much inspired by the Irish Proclamation of 1916. The Declaration is best seen perhaps as a reiteration of the 1916 Proclamation. The difference between the two documents is the context in which they were issued. When it occurred, the Easter Rising expressed the will of a relatively small minority of Irish nationalists, whereas in January 1919 the members of the First Dáil had the wind in their sails in the wake of that decisive election result a month before. The quest for some form of independence now had the undoubted support of a majority of the Irish electorate. 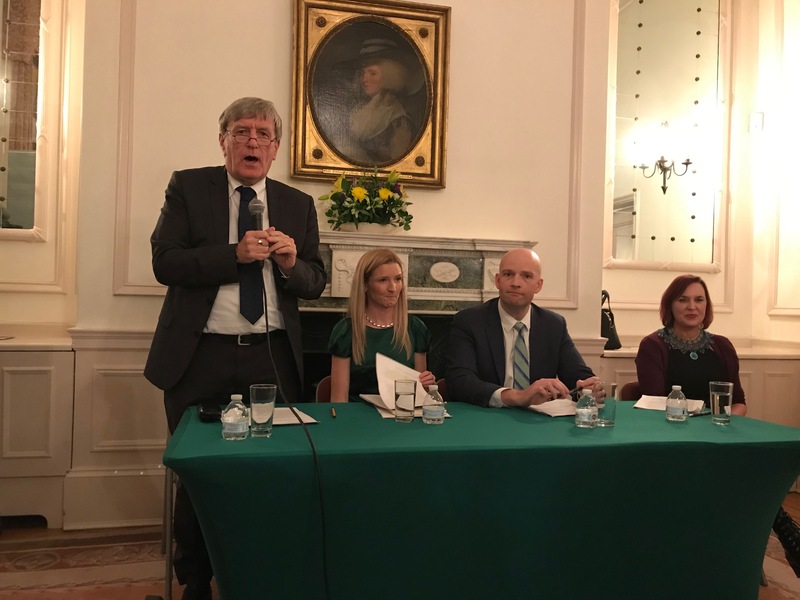 Irish Ambassador to the USA Dan Mulhall, standing, joined by, left to right, Dr. Jennifer Wells of George Washington University; RTÉ Washington correspondent Brian O’Donovan, the panel moderator; and Dr. Shirley Graham of George Washington University. Mulhall noted the Irish electorate in December 1918 was three times larger than in the 1910 general election, last before the Great War. Dr. Shirley Graham, a gender equality and international affairs associate professor at George Washington University, emphasized that women were a major factor in the 1918 outcome. Before the British Parliament granted limited suffrage earlier in 1918, “Irish women were invisible, unknown, and without voice,” Graham said. Their decades-long fight for the vote, radicalized during the war years, was finally realized at the polls, if only to be set back in the new Irish state. 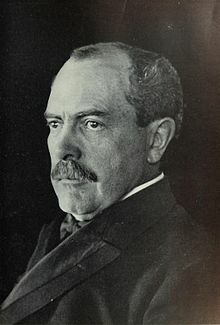 None of the papers were fully right, or completely wrong, said Wells, who warned not to “fetishize the assembly” a century later. The Dáil‘s “chaos created the inevitability of partition,” she said; but its members also “appealed quite brilliantly” to President Woodrow Wilson’s highest aspirations for the rights of small nations, and they “laid bare the gross tyranny” of the British Empire. Ireland was the first and only country to secure independence from one of the prevailing powers of the war, rather than one of the defeated empires, Mulhall said. The first Dáil became the foundation for a century of parliamentary democracy. This entry was posted in History, Irish War of Independence, IUC, Revisted, Politics and tagged 1916 Easter Rising, Dáil Éireann, Dan Mulhall, Irish War of Independence, Sinn Féin on January 23, 2019 by admin. Brexit feck it; no confidence next? “A day after overwhelmingly rejecting her Brexit deal, rebel Tories and Democratic Unionist party MPs swung behind the prime minister to defeat Labour’s motion of no confidence by 325 votes to 306 – a majority of 19,” The Irish Times reports. BBC Q & A on Brexit and the Northern Ireland/Republic of Ireland border, and cool multimedia feature, The hardest border, from 2017. Gladstone lost by a smaller margin than May, but he was removed from office soon after. 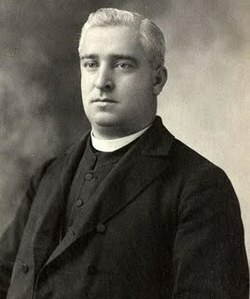 He returned as PM in 1892, for the fourth time; and he tried and failed for the second time to pass home rule for Ireland. 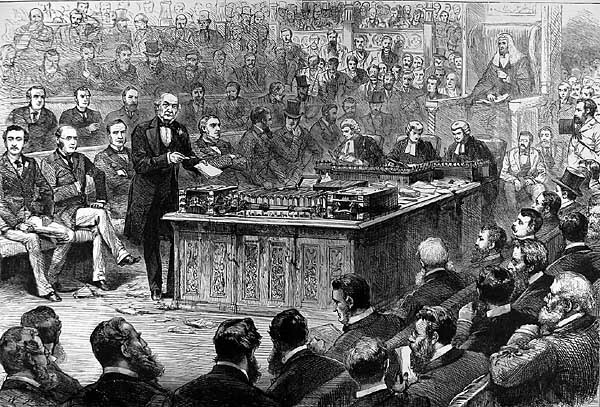 Gladstone, standing, proposed home rule for Ireland in 1886. Arlene Foster, leader of Northern Ireland’s Democratic Unionist Party, which props up May’s current government, has said her members will continue their support and not vote no confidence. I’ll update this post with the outcome of that vote and other Brexit developments. Brexit for Britain is not now a plan–nor so much as a proposition. It is merely a polemical phrase, of little importance to persons really interested in the condition of Britain, however invaluable it may be to the makers of party platforms … or to Parliamentary candidates. This entry was posted in History, Journalism, Northern Ireland, Politics and tagged Arlene Foster, Brexit, Theresa May, William Gladstone, William Henry Hurlbert on January 15, 2019 by admin. The new year–1919–began with new hope for Irish independence. In Ireland, the republican Sinn Féin party routed the old nationalist home rule party in the first parliamentary general election since 1910. 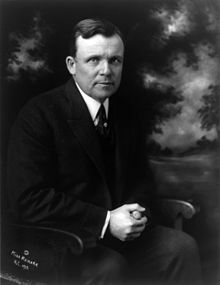 In America, Irish immigrants and their first-generation offspring aggressively lobbied President Woodrow Wilson and the U.S. Congress to support Ireland’s cause at the upcoming Paris peace conference. Unofficial results of the Dec. 14, 1918, election reached large American daily newspapers before Christmas. The official election count was delayed until Dec. 28, however, so the outstanding votes of soldiers still serving overseas could be included in the final tally. Substantial election coverage in the Irish-American weekly press did not begin until the first week of January 1919. Here are two examples. Dec. 28, 1918, will forever rank in the history of Ireland as July 4, 1776, ranks in the history of America; as July 14, 1789, ranks in the history of France, as the day of the birth of Liberty ranks in the history of every free people. The proclamation was flanked by these headlines, Complete Victory for Sinn Féin and The Irish Republic Endorsed, which filled the front page. Inside, the page 4 editorial proclaimed: Long Live the Irish Republic! The election just completed in Ireland is one of the most momentous that has ever been held in any country. 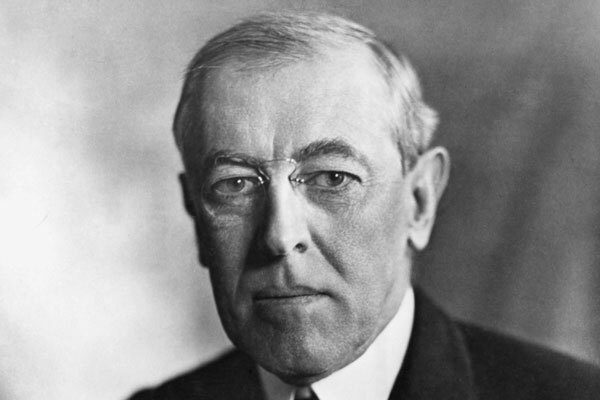 It is the first practical demonstration of President Wilson’s great principal of Self-Determination, and the results show that the Irish people were thoroughly cognizant of the great issues at stake. The question they were called upon to decide was: “Shall Britain continue to exercise sovereignty over Ireland?” And they answered with an emphatic, “No!” thus giving the lie direct to Britain’s paid horde of propagandists who had been telling the world for generations past that the Irish can never agree among themselves. About 700 miles southwest of Philadelphia, in Lexington, Kentucky, the Kentucky Irish American, offered more subdued coverage in its Jan. 4, 1919 issue. Stories about Ireland filled the left and right rails of the seven-column front page, sandwiching other news about domestic politics and religion. I am a sincere and and fully convinced advocate of self-determination for Ireland for her own sake, for the sake of democracy, but for England’s sake as well. I do not desire the downfall of Great Britain, but her tardy repentance. Ireland unfreed is England’s death warrant. She may succeed in keeping the Irish question out of the peace conference. I think she will. But she can not keep it out of the mind of a world from which the chains have been struck. It will live to accuse, to condemn and to execute. A victory of Great Britain over Ireland at Versailles will be no victory, but a defeat. It will be the signal for a new battle, the tactics of which have been taught the Irish race by England herself in her propaganda. The Irish American‘s page 2 editorial was headlined, What Ireland Wants. We said some weeks ago that the demand for self-determination—and this accurately defined—should come from Ireland. Those of Irish blood America and all lovers of liberty can then support that demand. That is the method of procedure which we should naturally expect. Instead we have the demand coming from the Irish In America—and this demand is couched in varying and ambiguous terms. In some cases it means home rule—some cases it means total separation and complete independence. What we need first of all is to find out what Ireland itself wants. … With that programme in hand we shall be able to give an intelligent expression of our support of It. As it is we are beating the air and accomplishing very little. The Irish people themselves must map out their own programme of self-government. We in America can have our own ideas regarding the matter—but we must not presume to dictate to the people of Ireland what they should do. In the following weeks and months of 1919, these two newspapers (and others in the Irish-American press) continued to be filled with stories about major events in Ireland’s struggle for independence, including key figures and developments in America. For this 2019 centennial, I will explore these people and events through the coverage in these two papers, in addition to other sources. NEXT: About the papers and their publishers. See American Reporting of Irish Independence for earlier work in this series. 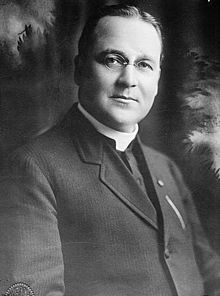 This entry was posted in History, Irish America, Irish War of Independence, Journalism, Politics and tagged Francis C. Kelly, Kentucky Irish American, Patrick McCartan, Sinn Féin, The Irish Press, Woodrow Wilson on January 2, 2019 by admin. 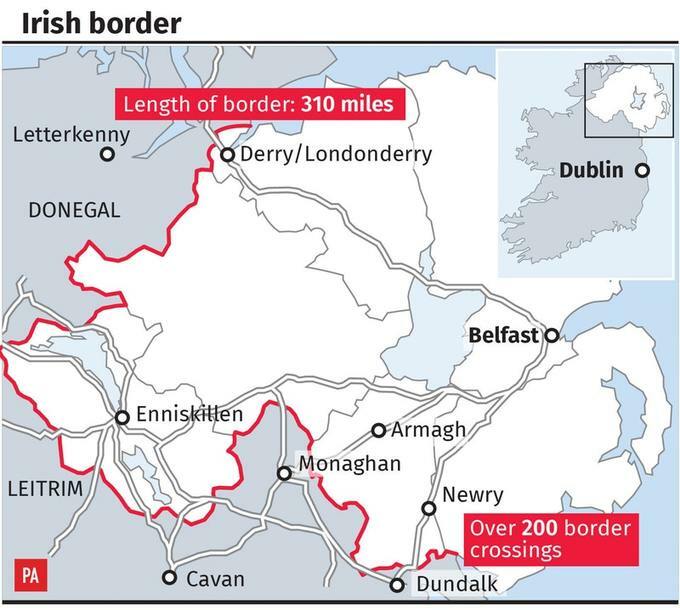 The most important story of (December) 2018 will likely be the most important story of (January) 2019: Brexit, and the impact on the Irish border. British Prime Minister Theresa May scratched the scheduled 11 December vote on her Brexit package when it became clear parliament would not accept the deal approved weeks earlier by the European Union. Now the vote is set for the week of 14 January, date to be determined. In mid-December, the Irish government published a “sobering” contingency plan in case of a no-deal exit by Britain from the European Union, a move that officials say would hurt Ireland more than any other country in the bloc, The New York Times reported. A second story in the Times described how Brexit could disrupt trade and reinvigorate the conflict between Northern Ireland and the Republic. “Ireland can lay credible claim to offer a haven from the populist plague that has infected so many other countries.”—Chris Johns in The Irish Times. Hopes for a new class of visa for Irish citizens were dashed in the U.S. Senate by Sen. Tom Cotton, an Arkansas Republican. Outgoing U.S. House Speaker Paul Ryan, a Wisconsin Republican, had pushed the measure through the lower chamber in the waning days of the session, The Irish Times reported. Tourism Ireland declared 2018 “the best year ever for overseas tourism to the island of Ireland,” with some 11.2 million visitors. Dublin Airport reported that it welcomed more than 30 million passengers for the first time in its 78-year history. I was happy to contribute to those numbers with visits in February and November, the first time I’ve traveled to Ireland more than once within one year. Irish President Michael D. Higgins signed the bill legalizing abortion in Ireland, as approved by referendum earlier in year. The procedures are expected to become available in January. The bestselling books in Ireland for 2018, according to The Irish Times. 2018 deaths of Irish celebrities and other notables, per Legacy.com. 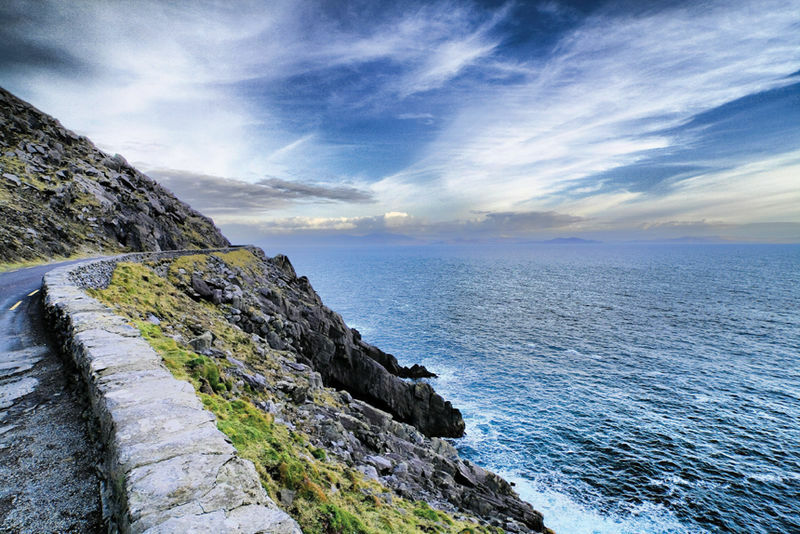 Ring of Kerry. Tourism Ireland image. This entry was posted in Arts & Culture, Business & Environment, Irish America, Northern Ireland, Politics and tagged Brexit, Michael D. Higgins, Tourism Ireland on December 29, 2018 by admin. Ireland Under Coercion, Revisited: This project explored aspects of the 1888 book Ireland Under Coercion: The Diary of an American, by journalist William Henry Hurlbert. 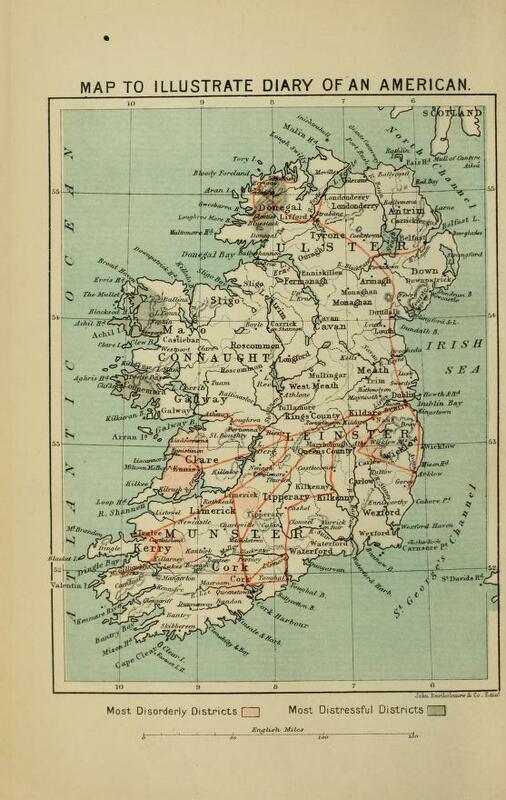 The series followed Hurlbert’s six-month reporting trip to Ireland, from his views about the agrarian agitation and home rule politics of the period, to his descriptions of Irish landscapes and landmarks. * I retraced some of Hurlbert’s footsteps during my February and November trips to Ireland. * A condensed version of my research appeared under the headline “An American Journalist in Ireland Meets Michael Davitt & Arthur Balfour” on The Irish Story website. * The work was recognized in the American Journalism Historian Association’s “News & Notes” feature. 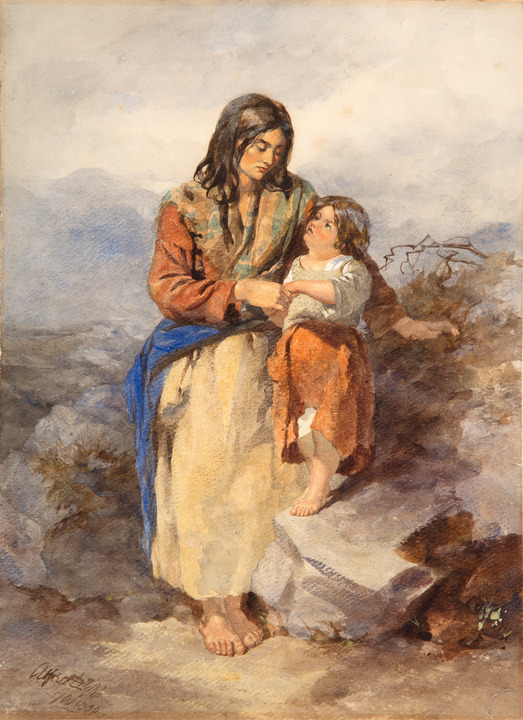 Ireland’s Famine Children “Born at Sea”: My research of the online Famine Irish Passenger Record Data File held by the National Archives & Records Administration (NARA) resulted in a Winter 2017/18 story in NARA’s Prologue Magazine. * In September, I gave a presentation about the story at the Irish Railroad Workers Museum in Baltimore. 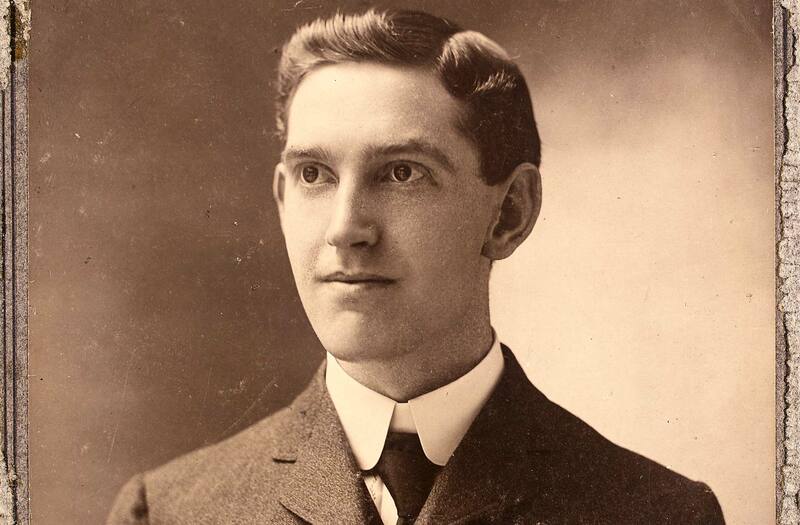 An Irish-American’s most perilous summer, 1918 Kerryman John Ware immigrated to Pittsburgh in 1910. Eight years later, he was shipped to the battlefields of France. Shamrock Fund and the Irish War Exhibit of 1918 An Irish socialite visited Pittsburgh to debut a traveling exhibit of war items intended to raise money for the Shamrock Fund, a charity for wounded Irish soldiers. 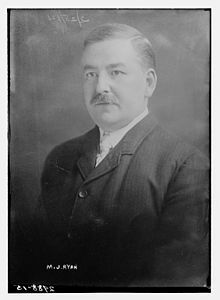 Another two-part piece, Troublesome Men: The Irish Nationalist Feud in Western Pennsylvania, 1894-1896,explored divisions among pro-independence Irishmen in Western Pennsylvania ahead of the 1895 Irish National Alliance convention in Chicago. Two members of the Pittsburgh delegation were ousted from the meeting. See PART 1 & PART 2. Catching Up With Modern Ireland: I introduced a monthly roundup of aggregated news, feature, and opinion content from Irish and Irish-American media. Coverage included the May repeal of Ireland’s constitutional abortion ban; the August visit of Pope Francis to Ireland; and the October re-election of Irish President Michael D. Higgins. … Brexit and the sidelined Northern Ireland Assembly remained in the news throughout 2018, the former a key issue for 2019. … Former President Bill Clinton received the Freedom of Belfast honor for the Good Friday Agreement; Speaker of the U.S. House of Representatives Paul Ryan was floated as U.S. Ambassador to Ireland, a post that remains unfilled; and Irish-American gangster James “Whitey” Bulger was murdered in federal prison. … Fáilte Ireland unveiled its “Ireland’s Hidden Heartlands” tourism brand to drive visitor growth across the Midlands region. … Solas Nua, the Washington, D.C.-based Irish arts group, staged “The Frederick Douglass Project” about Douglass’ 1845 lecture tour of Britain and Ireland; “Black ’47,” a fictional film treatment of the Great Famine debuted to generally good reviews; and the “Coming Home: Art & The Great Hunger” exhibit from Ireland’s Great Hunger Museum at Quinnipiac University in Hamden, Conn., toured Ireland. …. I’ll post a December update before the new year. 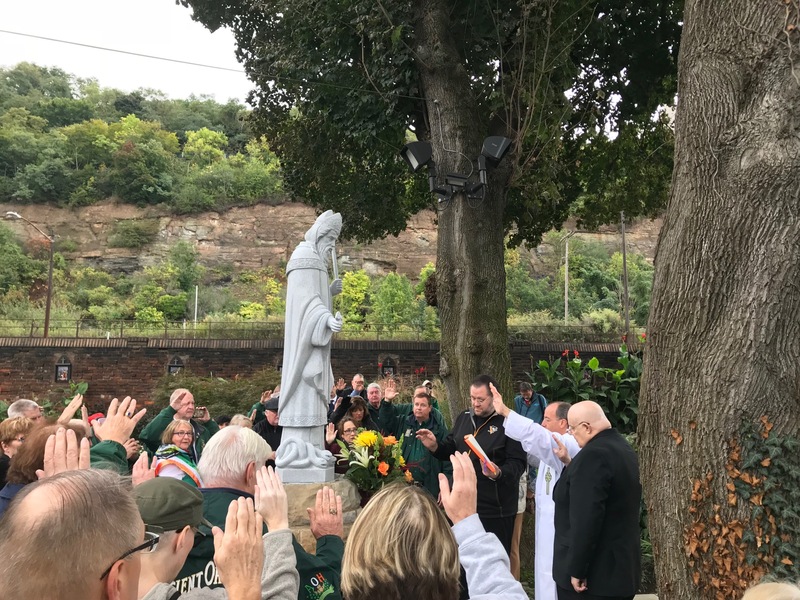 AOH and other Irish Americans dedicated a new statue of St. Patrick in the garden outside Old St. Patrick’s Church in Pittsburgh, top, and the twin spires of St. Patrick’s Cathedral in New York City. I visited both churches in 2018. 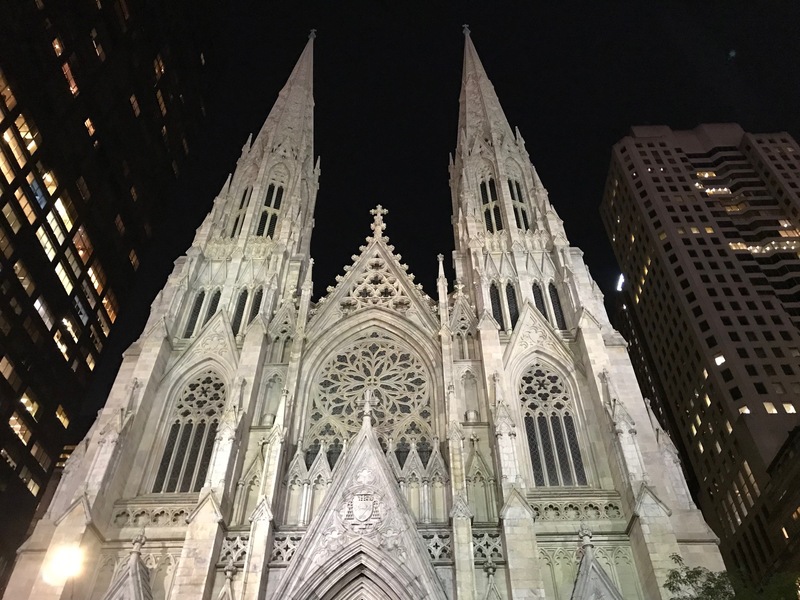 More in the St. Patrick’s Churches section of the blog. IN IRELAND: the Michael Davitt Musuem, Straide, Co. Mayo; National University of Ireland, Galway, Archives; Trinity College Dublin, Archives; National Library of Ireland, Dublin; National Print Museum, Dublin; and the Newspaper and Periodical History Forum of Ireland, especially co-founder Felix Larkin, who helped with the Hurlbert project and welcomed me at NPHFI’s annual conference in Galway. Another round of applause for all the conference’s excellent presenters. 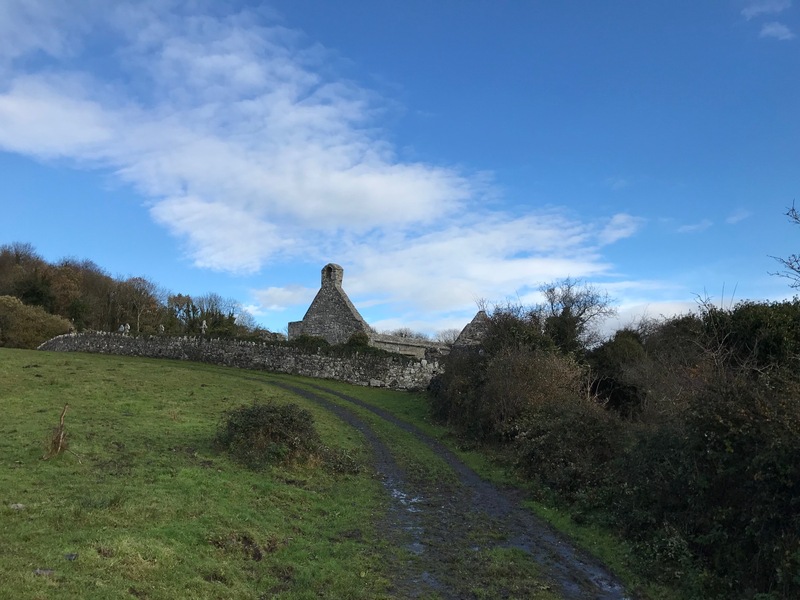 … Also, thanks for the continued friendship and assistance of John Dorney at The Irish Story; Kay Caball at My Kerry Ancestors; and Mary Cogan at Listowel Connection. … Special thanks to my relations, Michael & Nancy Lynch of Navan, for their hospitality, and for the gift of a 40-page F.S.L. Lyons’ pamphlet, Parnell, dated from 1963. IN AMERICA: the National Archives & Records Administration, College Park, Md., and the editors at Prologue Magazine; Luke McCusker at the Irish Railroad Workers Museum in Baltimore; historian Daniel W. Crofts, who helped with the Hurlbert project; and the Pittsburgh Post-Gazette, which published my story about Frederick Douglass. … Also, Amy Brunner and Christopher Lemery of the University of Pittsburgh Library System, on separate requests through the “Historic Pittsburgh” website. … In Washington, D.C., Georgetown University and Catholic University of America libraries, especially Shane MacDonald at CUA’s Research Center and University Archives; the arts group Solas Nua; and Dan Mulhall, Ambassador of Ireland to the U.S. and the Irish Embassy staff, who always warmly welcome Irish Network-DC. … The Arlington Public Library, Arlington, Va., provided several books from university library collections via its Interlibrary Loan service. … Apologies if I’ve missed any person or institution. Finally, thanks again to all those who visited the blog, especially email subscribers (at right) and those who follow me on Twitter and retweet the content. Your comments and suggestions are always welcome. The road leading to Killone Abbey in County Clare. 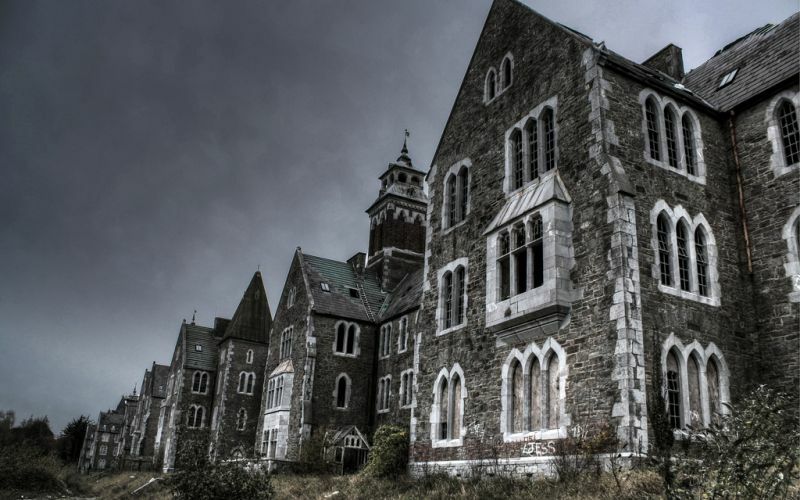 The ruin was visited by American journalist William Henry Hurlbert in 1888, and by myself in November 2018. This entry was posted in Arts & Culture, Business & Environment, History, Irish America, Irish War of Independence, IUC, Revisted, Journalism, Northern Ireland, Politics, Religion on December 22, 2018 by admin.